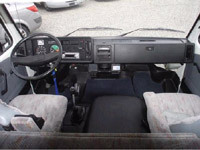 In 1988 the VW Westfalia LT Sven Hedin model was given a total interior redesign. 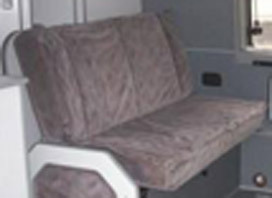 The furniture in the new model was now in light grey with a dark grey edging, the upholstery material was changed and the opening rear door design was changed to a non opening full width plastic panel. 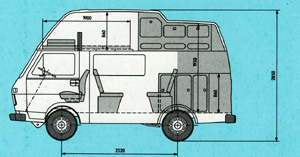 The 1988 VW Westfalia LT Sven Hedin Camper available in 1 colour. The 1988 Volkswagen Westfalia LT Sven Hedin camper had light grey furniture with dark grey edging. 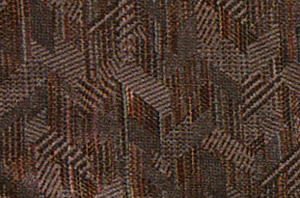 The upholstery in the 1988 VW Westfalia LT Sven Hedin camper was a brown beige multicolored pattern called “Baroness Grey/Blue” and was as far as I know unique to this model and year. 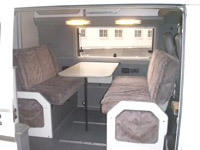 The curtains for the front and sliding door in the VW Westfalia LT Sven Hedin camper were light grey. 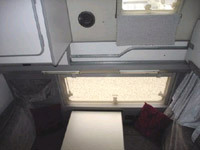 The VW Westfalia LT Sven Hedin had roller blinds on the windows in the living area and the rear kitchen window. 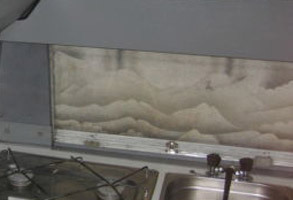 The roller blinds on the side and rear window had mosquito nets for use in the day time and the blinds would keep the light out when sleeping and stop people seeing in in the evening. 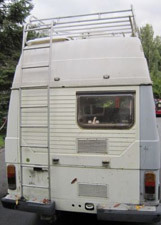 The high top roof on the VW Westfalia LT Sven Hedin camper was an original Westfalia hightop constructed using strong Glassfibre. The interior has a standing height of 212 cm at the front and 186 cm at the rear. 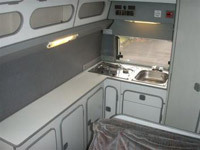 In the front part is mounted above the cab a pull out double bed of 160 cm x 200 cm. 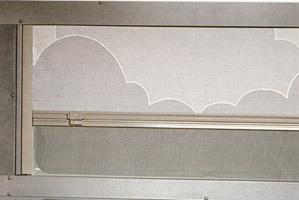 On the rear lowered part of the roof there is a luggage rack which can be accessed using the ladder mounted on the rear panel (note this model had a plastic full width rear panel instead of opening rear doors). 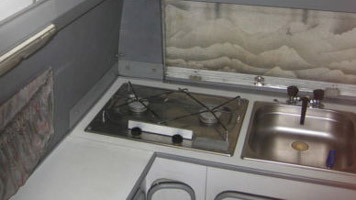 The flooring in the rear of the 1988 VW Westfalia LT Sven Hedin camper was a grey PVC hard wearing floor surface. Tinted, heat insulating and double glazed plexiglass windows in rear living area. One opening window on the side and one opening window at the rear above kitchen. 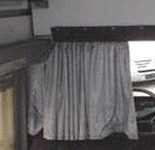 The living room and rear kitchen window had roller blinds so that people cannot see in from outside and to prevent light entering the vehicle when sleeping. 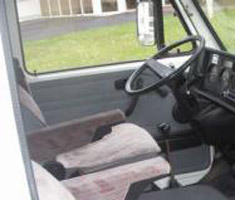 For the front cab area and the sliding door there are grey curtains. 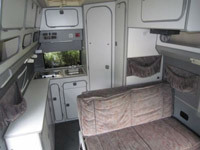 At the center of the vehicle is the spacious living / sleeping room with 2 large padded seats. 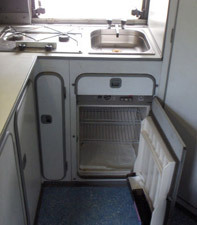 The front bench, 1.30 m wide, can be folded using the 2 handles due to the original Westfalia fittings allowing - you sit either in the living position or in the direction of travel position. 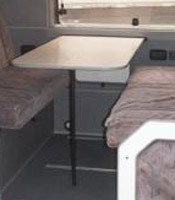 Rear seat benches are both equipped with safety lap belts for 2 persons. To sleep the seat can be folded by simply tilting the backrest of the back cushion to make a double bed of 195 cm length and 130 / 115 cm wide. 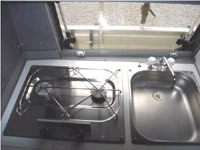 At the rear is the kitchen combination with two flame gas cooker, large sink with hot and cold water mixer tap, cutlery draw, fridge and large supply cupboard. Above the kitchen combination is a large storage locker with shelf. The vehicle is equipped with plenty of storage space. In addition in the kitchen there is a half-height tableware cupboard that can simultaneously serve as a countertop. 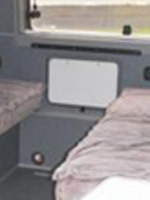 In the rear part of the vehicle there is a wardrobe 35 cm wide. A linen closet, many overhead storage bins and the space under the seats give a you enough space for everything you need during a long journey. 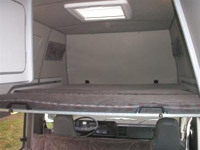 For the bedding there is additional space in the hightop roof in the area of the folded double bed. 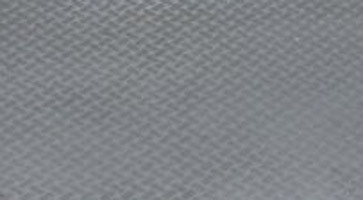 The shower cell with wash basin is constructed from glass fibre plastic in one piece so is completely watertight. 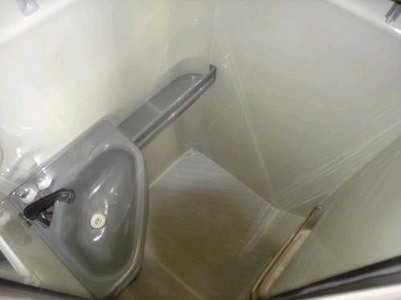 Equipment includes a hot and cold water mixer tap with integrated shower head, mirror with integrated light, toilet cabinet, hand towel holder and a place for a portable toilet. The freshwater tank has a capacity of 100 litre. 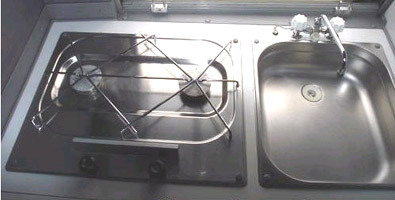 There is a central pump for running water and for hot water an automatically operating hot water boiler. Under the vehicle is a 70 litre waste water tank. External underbody 7.8 kg LPG tank with fuel level gauge. 12 Volt circuit with 160 Amp leisure battery with split charge relay and automatic battery charger to power transistor lights, the water pump and the heater fan. 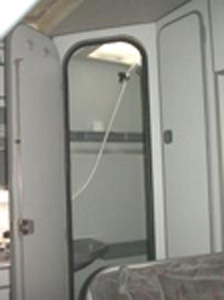 A 12 v socket, 1 inverter for converting 12 volt DC voltage to 220 volt AC voltage for using an electric shaver and 6 lights for the living, kitchen and shower rooms complete the equipment. Above the rear kitchen unit there is an operation and control unit including 2 safety cut outs for the 12 volt circuits, a diode display showing the charge level of the second battery, a level indicator for the fresh and waste water tanks, a control indicator showing when the fridge is operating on gas and the operation and control unit for the hot water unit. The side walls of the living room and the roof are insulated with 40 mm thick non-flammable mineral wool.. The insulation is strongly glued to the body. 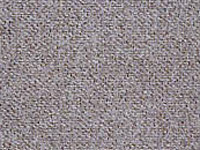 The roof and side wall paneling are coated with an imitation leather finish. Under the floor there is a 10 mm thick Bitumen insulating board. 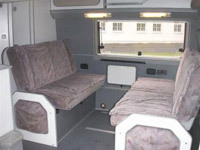 In conjunction with the optional padded and quilted curtains and with the heating switched on the Sven Hedin can remain fully operational at temperatures down to -15 C.
The flooring was a durable grey PVC in the rear and the front cab area was grey carpet. 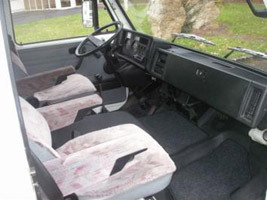 The original Volkswagen seats with upholstery matching the seat banks in the living area. 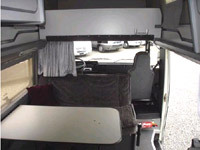 There were many accessories available at extra cost for your Westfalia LT Sven Hedin Camper. 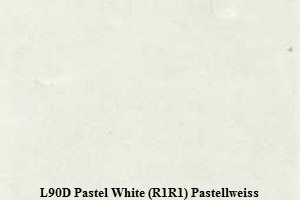 Below is a list of some of them taken from 1988 Price List. Radio Package - Blaupunkt. Order Number 217 002 346 001 Cost 1440 DM. Radio Package - Phillips. Order Number 217 003 346 001 Cost 1020 DM. Cruise Control. Order Number 217 001 446 001. Cost 906 DM. Eberspacher Timer for petrol or diesel night heater. Order Number 216 001 446 002. Cost 196 DM. Additional glovebox and storage. Order Number 217 005 226 001. Cost 161 DM. Stands for levelling van (for front). Order Number 217 001 203 010. Cost 408 DM. Stands for levelling van (for rear) (not in combination with M208. Order Number 217 001 203 015. Cost 408 DM. 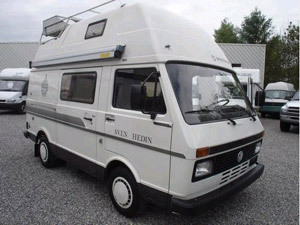 1988 VW Westfalia LT Sven Hedin Camper side stripes. Jan 1988 VW Westfalia LT Sven Hedin Camper Sales Brochure Prospekt (5 Pages Colour). 1988 VW Westfalia LT Sven Hedin Hire Brochure Dutch (6 Pages Colour). Mar 1989 VW Westfalia Accessories Zubehör brochure including Sven Hedin (20 Pages Colour). June 1988 VW Westfalia LT Sven Hedin Camper Price List Preisliste (4 Pages Black and White).